We have built 6 homes in Ohio and Arizona before moving to Colorado. Upon meeting Steve Foran and Stonefield Homes we were "sold ". We appreciate the impeccable attention to detail and quality while still maintaining a reasonable price point. Everyone was attentive to what we wanted in a home. The structure and mechanicals of the home Stonefield built for us are of highest quality. When we closed on the home and had the final walk-through, the home was in perfect shape. How different this experience was from those we had had before with builders and walkthroughs. We cannot say enough about the thought and care that go into Steve Foran's work. We wanted to share our experience and recommendation with people contemplating building a custom home with Stonefield Homes. From the start we were impressed with their level of engagement, attention to detail and originality. They did not start by taking out existing plans to see which one was the best compromise for us, they asked questions and listened. A simple yet amazing process that netted a plan that captured every aspect that we found important in a house. The plan even included a niche for our china cabinet and additional circuits for my workshop because I mentioned in one meeting the hassle of tripping a breaker. Our friends shared horror stories about the building process. We found it an incredibly easy and fun process, because they made it that way. We were on the site nearly every day. Steve and Jim always took the time to talk with us and listened to our ideas, even changing the plans when it made sense. They pick subcontractors that share their passion for building and working with customers. They were all great to work with, we were accepted as one of the crew, especially when it was our turn to buy donuts. We consistently heard from the subs that Steve and Jim were obsessive about quality. We saw that when they rejected a door after they noticed the reveal was 1/8 inch different from top to bottom, something I would not likely have noticed. Unlike when we have built before, we were made to feel like this was our home from the planning process and throughout building, not just another customer to be kept at arms length until closing time. 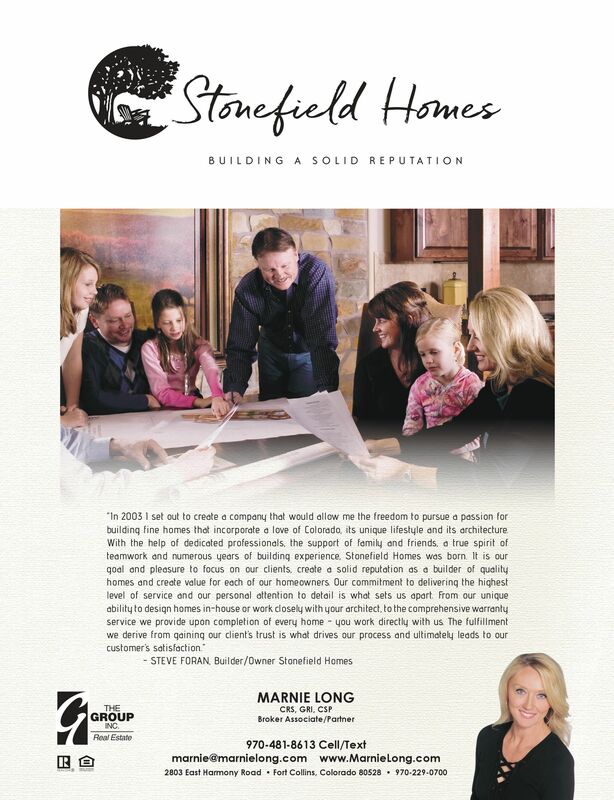 Building a home with Stonefield was truly a personal experience and one that I would recommend to anyone. We are writing this letter highly recommending Stonefield Homes as a custom home builder. Our home was completed in July of 2005 and it far exceeded our expectations. Beginning with the initial meeting, we were impressed with their attention to detail and their willingness to listen to buyer’s needs. Our ideas were incorporated into the home’s design while offering critical suggestions that improved the home’s integrity and function. Upon completion of our design, the home’s timeline was introduced and a closing date set. This portion of the process was impressive. Each stage was met in a timely fashion. There were no delays and our home was ready and in move-in condition on a predetermined date set eight months prior. Throughout the entire process, the Stonefield Team was always available to us. Our questions were met with prompt answers in a helpful and positive manner. Building our dream home was an enjoyable experience. We had heard of the horrors and pitfalls of building your own home. At no time did we experience any of these. The only surprises we encountered were positive ones. As veteran home buyers, we have bought and sold seven homes in the last decade. Our experience with Stonefield Homes was by far, the most positive process we have encountered. Our home is superbly built and is one we will cherish for many years to come. If we ever decide to build another home, we will not hesitate to build with Steve Foran and his team again. Building our home with Stonefield Homes was a seamless process that we truly enjoyed. Thank you, we appreciate all you did for us. I am writing this letter in regards to FirstBank's relationship and experience with Steve Foran and Stonefield Homes. Steve has been a FirstBank customer since 1986 and over that time has held numberous accounts and loans that have all been handled as agreed. Steve has built a very solid reputation as a builder in Northern Colorado. We have partnered with Steve and provided financing for his construction projects. His hands on approach allows him to stay on budget and complete his homes on time. Steve has been very easy to work with in our construction draw process and is very responsive to both his customers and the bank. We recently closed another construction loan for Steve and Stonefield Homes. As you know, the struggling economy has made most banks pull back on any type of construction lending and only the most qualified borrowers are able to get financing. steve and Stonefield Homes have been able to perform well through a challenging market and still remain very strong wile maintaining a reasonable cushion of liquidity. I would be happy to talk to you and answer any questions you may have. Please feel free to call me at 970-282-3901 with any questions. It is a privilege to share with you what a wonderful experience we had in working with Stonefield Homes, Steve Foran and Jim Burczyk, in the building of our custom home in 2004. The first meeting we had with Steve was to discuss what were ‘musts’ in our home only to have him return to us with a floor plan to meet each of our criteria and then so willing to add and delete to find the perfect fit. From the beginning it was attention to details. Almost daily we would check progress and Steve was available to answer questions and willing to tweak the plan if possible. His entire crew was always accommodating and met us with courtesy. For the first couple of years there were small concerns that came up; ie. a loose door handle, final grade needed adjusted. They always stood behind their work and guaranteed our satisfaction. People warned us that building a home together can be rough on a relationship but we totally enjoyed the entire process. We would highly recommend Stonefield Homes for your custom building needs.